Transfer wide receiver Trevon Grimes is adjusting well at Florida while he awaits a decision on his eligibility for the 2018 season. The Florida Gators got a huge pickup in the offseason in Ohio State transfer Trevon Grimes. The sophomore wide receiver’s journey to Florida did not come under the most optimal circumstances. He chose to come back closer to his hometown of Fort Lauderdale as his mom deals with undisclosed heath issues. He said she is doing better, but it has still been a difficult experience for him. The football field is his escape from all of it. Grimes knew he wanted to be closer to his mom during this time, so it came down to which school in the state would be the best fit for him. Miami was the closest to home, but coming to Florida would mean starting on a level playing field. 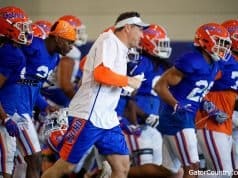 Once Dan Mullen took the job as the new head coach of the Gators and co-offensive coordinator/wide receiver coach Billy Gonzales followed along with him, it’s like a green light went off in Grimes’ mind. He knew Florida was the place for him in that moment, and after going through a week of practices, Gonzales has proven him right. 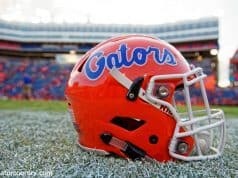 It also helps that Mullen runs a very similar offense to the one he played in under Urban Meyer at Ohio State. He is pretty much up to speed on what will be expected in this offense, while the other receivers are starting from scratch. So even though he is the new guy, it doesn’t always feel that way. While is adjusting well under the coaching staff, adjusting to a completely new environment and new teammates can be one of the biggest struggles for a transfer. He already had relationships with a few players, including Jake Allen and Emory Jones, but the rest of the team made the transition easy as they embraced him as one of their own immediately. Now that he is comfortable in the new environment, all that’s left to do is wait. Under the NCAA’s rules, Grimes must sit out one season. He has applied for a hardship waiver due to his circumstances, but it is all a waiting game until a decision is made. 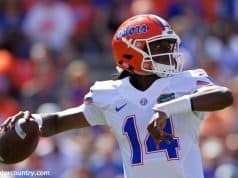 Whether he is deemed eligible to play this season or not, he has found a new beginning and feels excited for his future with the Gators.